Michele Morata is an 18 year award-winning full-time Fine Artist whose work has been collected throughout the U.S. and internationally thru exclusive Fine Art galleries, exhibits, interior designers, and the internet. Working with over 150 imported organic texture mediums, she considers herself an 'eco friendly' green artist and uses recyclable organic mediums and water-based oils with no added chemicals in all her Original Artwork. She is currently under art review at 2 museums, and has had her artwork featured in public art installations, hospitals & hotels internationally. Some of her paintings are available for art licensing and book covers. All Original Paintings come with Certificates of Authenticity, professionally wiring, and ready to hang. To bring peace, joy, and positive energy to our world thru my creative talents. Michele combines her 2-D & 3-D technical, artistic, literary, and research skills, to create one-of-a-kind contemporary paintings & commissions including cutting-edge experimental abstract and modern. She also explores poetic graffiti art in many of her recycled mixed-media creations. 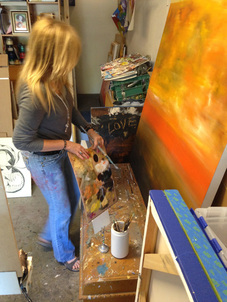 Michele's painting passion began as a young child. She received her first Art Award at age 6 and had her first artistic memory of being a painter at age 4. She studied at Orange County Museum of Art, a variety of universities, and under the guidance of a few talented fine artists; however, she feels her best works exhibit painting from her intuitive spirit. Along with painting, she keeps a daily Art journal which includes extensive notes on her painting dreams, as well as poetry and thoughts inspired by her love of art. 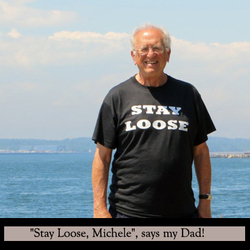 Michele has authored a small poetry book entitled, "Querencia: Poetry on Life, Love, and the Pursuit of Self-Honesty". CURRENT MAIN INFLUENCES: My near death experience, nature, and poetry. My mother gave me the gift of looking at the world thru the creative intuitive & my father gave me the gift of looking at the world thru the linear technical. My spiritual life has influenced me tremendously & allowed me to trust both these left & right brain processes that synergistically work in harmony to produce the original works. DEFINING MOMENTS: One of my mother's dreams was to be a professional artist, but she lacked confidence in herself and her talent. Before she passed away, she told me that she felt as if she had never "really lived". This had a profound impact on my life. Four years after her passing, I had a near death experience & miracle consciousness, which re-defined my courage & contribution to our world. Coming in 2018 - Feature on Dad's " Zen " Garden - It's Awesome & Inspirational !